Something interesting from Auto China 2014 in Beijing – Dongfeng-Nissan has unveiled the Venucia R30, a vehicle that’s clearly based on the Nissan March/Micra, but one that’s dropped the cute, rounded face for a more angular, prosaic front end. It’s the fifth production model from the Venucia sub-brand, which was established in 2010 to develop and design vehicles for the Chinese market. 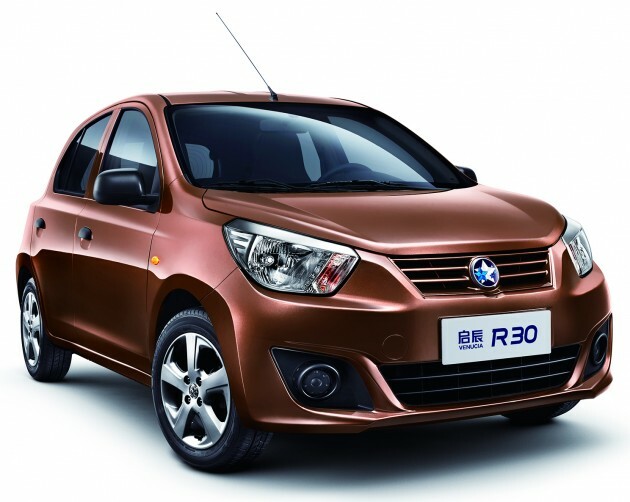 Motivated by a 1.2 litre petrol engine, the Venucia R30 will be priced in the region of 50k RMB (RM26k). Dongfeng-Nissan has also announced that the Venucia e30 – a rebadged Nissan Leaf – will go on sale in China beginning September. EV pilot programmes have already started in Guangzhou, Xiangyang and Dalian, with a total of 300 of the electric vehicles recording a total mileage of one million kilometres since December 2013. The remaining three current Venucia models are the D50, R50 and R50 X. The first two are based on the first-gen Latio sedan and hatch respectively. The R50 X is basically an R50 with SUV-inspired looks, X-Gear-style. The sub-brand, named after the Roman goddess Venus, sold more than 100,000 cars in 2013 and is targeting a 50% sales increase this year. Now swap the japanese brand with local chinese brand. Apa lagi cina mau? The D50 certainly looks better than the latio. What? Based on Nissan with 1.2cc just 26K, impossible to get this price in Malaysia. 26K still need to topup 2K++ to get viva 850 here, sad. I am puzzle that how can their JV can bring down the price of Nissan March to RM26k?? But what happened to our price of Perodua JV?? Something is very wrong with our automotive industry. Next Post: Volkswagen Golf R Mk7 spotted on the move in Bangi!